This interactive, multimedia adventure introduces children ages 3 to 6 to the world of computers while teaching them logic, organization and memory skills. Little Bo Peep has lost her sheep; the cat's lost his fiddle; there's lots of trouble in Mother Goose Land and it's up to you to help out. The child reunites 18 delightful animated characters with their lost items. In return, each character performs a song complete with animation and text, so your child can sing along. Mixed-Up Mother Goose was originally introduced by Roberta Williams in 1987 and became one of the best-loved children's software titles of all time. The child can pick from a range of characters to find the one that most resembles him or herself and the game uses a simple child-friendly interface. 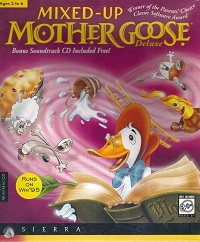 Following a re-release with the SCI engine with both EGA and VGA graphics in 1990, Mixed-Up Mother Goose Deluxe is the fourth installment of the game. 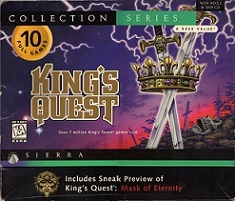 Updated for multimedia computers, it has high-resolution graphics, digitized music and voice, and a host of new features. Included in the box is also a musical CD for your stereo system. It was released for the PC (Win 3x and Windows 95) and for the Mac.